It might not be immediately obvious to you what your audience wants to know, but after listening to this episode you’ll have a complete bag of tricks for finding the ideal content for your blog and website. Listen to “Finding Topics for Your Blog and Content ” on Spreaker. What can you learn from these studs? Listen to this episode for a fun tip from the world of traditional publishing. Barry explains how to make great content from roundup posts somebody else created. Andy suggests you can plug every “hole in your bucket” by adding a live chat to your website. 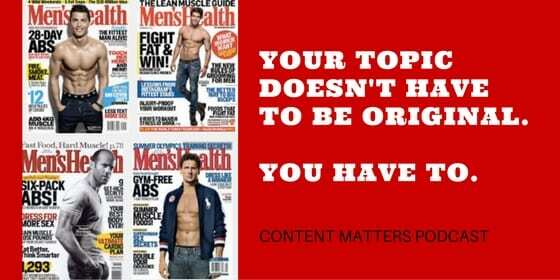 On the next episode of Content Matters: What to put on your homepage.